Christmas portions … a lavish triple helping of blog coming up, to catch up. Next entry will have the exciting (and chalky) start to 2015. 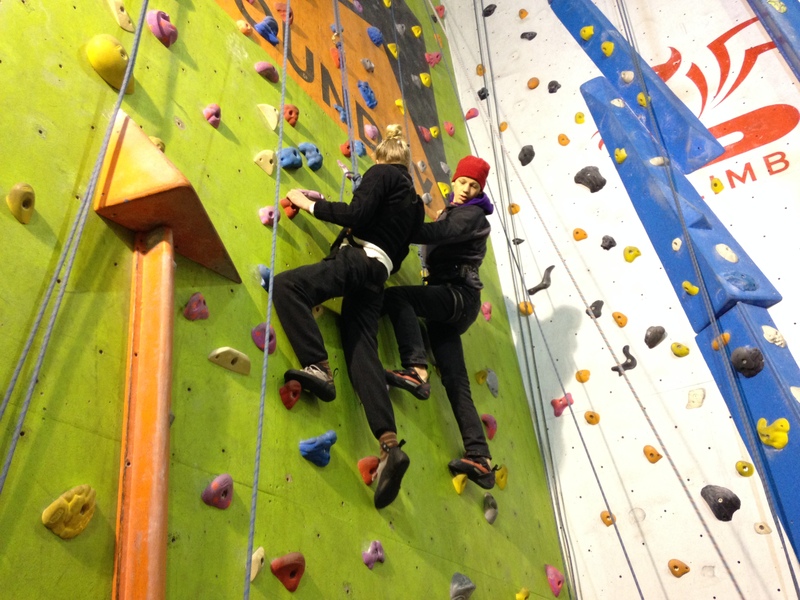 Mid-November’s climb at the Foundry is at the shapely dalmations. Hazel is up high when we arrive, climbing a non-dalmation (trickier) class of holds. 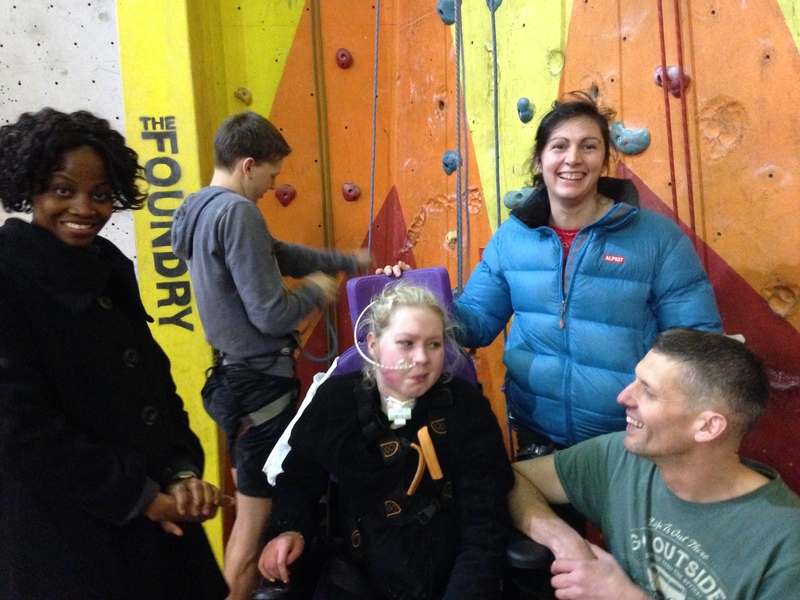 A quick news catch up … the 3 new wheelchair climbers have visited the Foundry twice, success! And Lasse is doing OK after his bike stunts with Robin, though he’s had his broken collar bone operated on in Germany, and it turns out his shoulder blade is fractured too. Nick hints at new equipment later, but Clare gets started with a climb on the holds. She is stretching up really well. But she is leaning back a lot – tiring for her neck. Harness adjustment for the 2nd climb, to help with the leaning back. Also a rope swap. I ask for help in matching up the various names for ropes. Ahh right! Got it sorted now: ‘safety rope’ means ‘belaying’, and ‘pulley rope’ is the one with the 2:1 gearing for extra assistance. 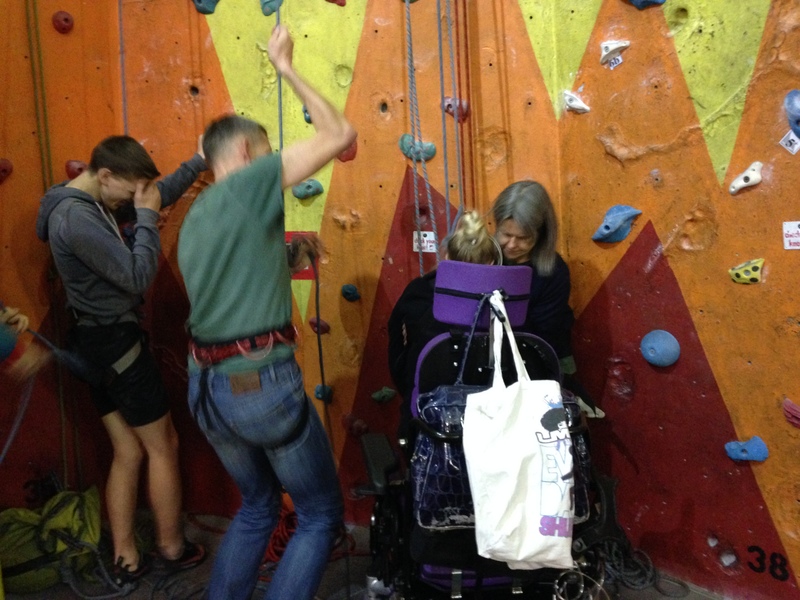 Robin now takes pulley rope, while Hazel and a sandbag take safety rope for Nick, and Helen continues on safety rope for Clare. 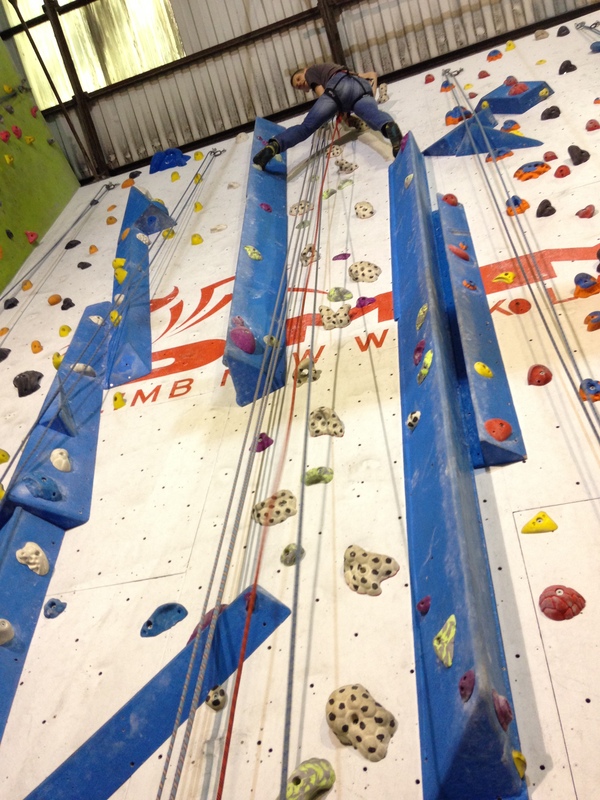 Clare gets higher this time, with better body position … also some nice foot pushes, and more oomph from the ropes. Now, says Nick, time for the new thing. He fetches The Foundry’s Karl who attaches a ‘bolt line’ at the bottom of the wall. Nick climbs up to run a static rope from top to bottom. The jumar attaches to the line with a nifty loop, whose name I struggle to remember. It’s an eye-opener to see this much improvement since Clare last used a jumar. 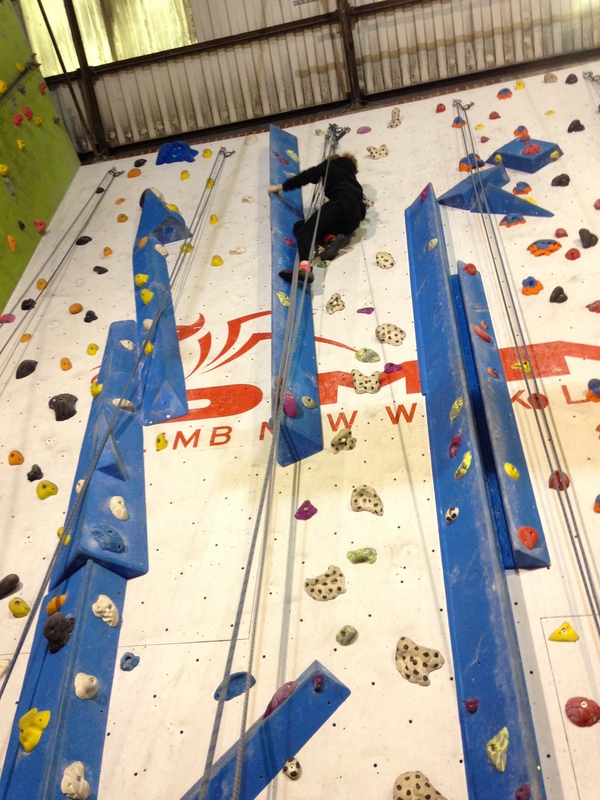 Climbing has developed arm lifting power and it seems gripping power has leapt forward too. I marvel at Clare’s knuckles showing white – she really is gripping! No more need for the the cycling gloves, evostik and velcro (but that technique is ‘in the bag’ for others to make use of). Firm pulls from Robin & Helen. Clare looks ninja-like from the back. Back down and we’re all smiling and saying how well Clare did. Clare herself needs encouragement to smile. But she says that it’s surprising how she has improved on the jumar. “And no vent too”, Nick adds. Clare looks proud and strong in the team pic. A week later Clare climbs in the early evening. We’re in the Furnace – definitely not a hot Furnace, and Robin’s bare knees look decidedly dusky. “How are you today?” Nicks asks Clare as we arrive. “Very well, how are you?” replies Clare, chirpily though quietly. She’s been very healthy recently, but yesterday’s inaccurately swallowed cake mixture might be why her voice is faint today. Hazel is at Laserquest with friends, so I wear a harness and take the pulley rope. 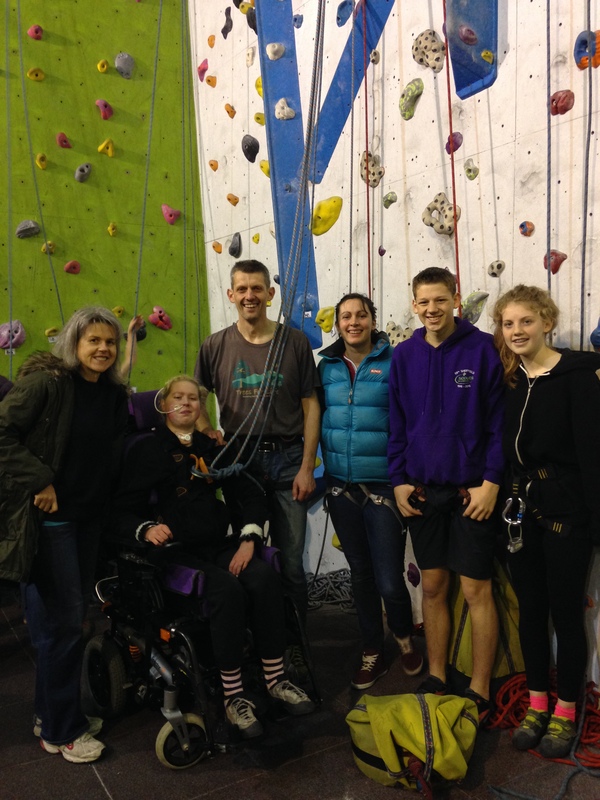 Robin climbs with Clare, and Nick & Helen are belaying. 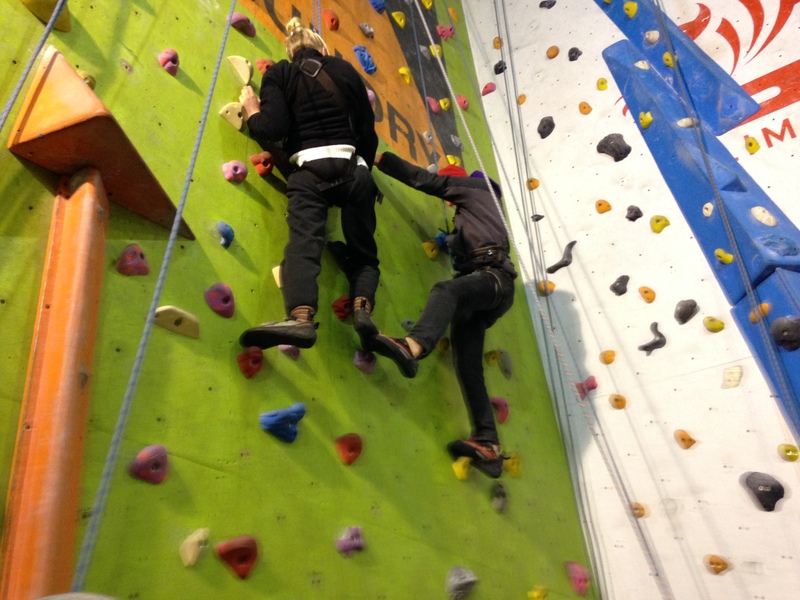 Carer Ade takes my iPhone and captures the ‘getting on wall’ start to the climb. Using feet too – left foot at any rate, supported by Robin’s foot. Clare gets surprisingly high before she has had enough. Abseil to chair. Clare looks happy and strong but end of trache is exposed – speaking valve has mysteriously disappeared. We manage to find it in Clare’s clothing. Rest time chat: Clare and Robin have post-16 decisions to make. Robin is thinking King Edwards – best for outdoor activities 🙂 Clare isn’t sure, but will stick with Forge Valley, dependent on grades. 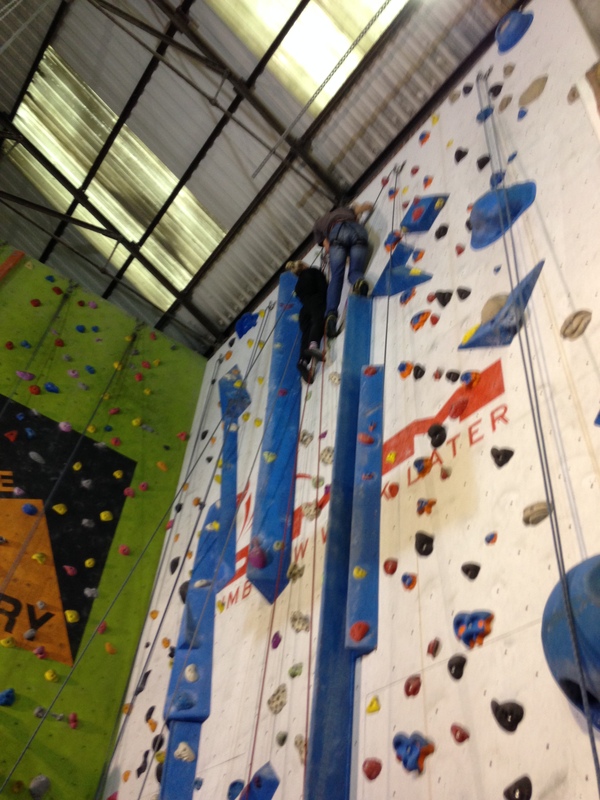 Now for climb two. 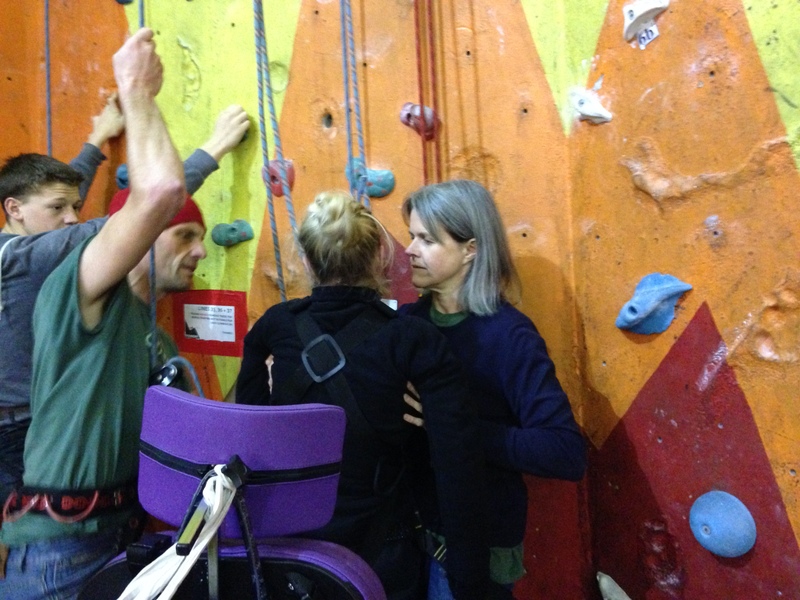 Nick says we shouldn’t say anything to Clare about placing her hands and feet – up to her to plan her route. It’s really hard not to make suggestions, oops. Clare sets off determinedly. The rest of us mostly manage to stick to “nice one!” and “yep!” though Nick and Robin blab once each, and get laughed at. 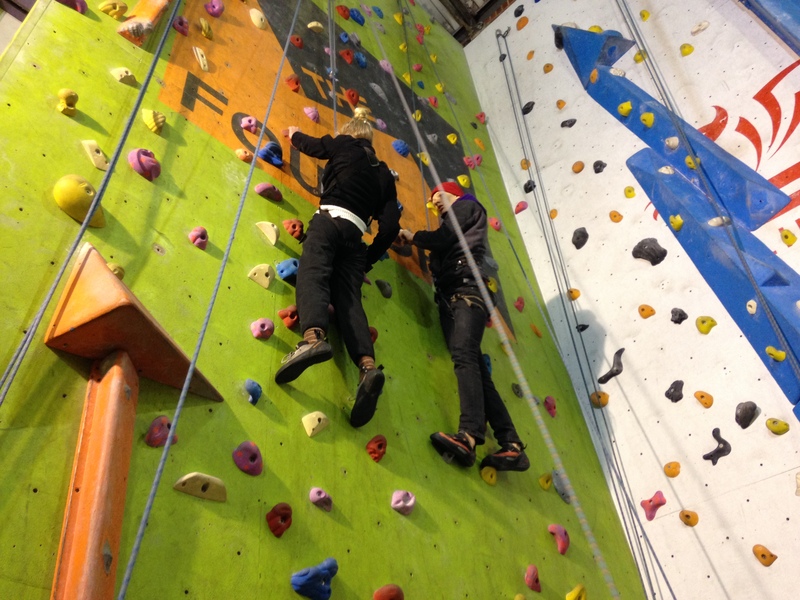 Robin uses momentum to keep Clare on the wall, and Clare finds herself holds. Looking good! 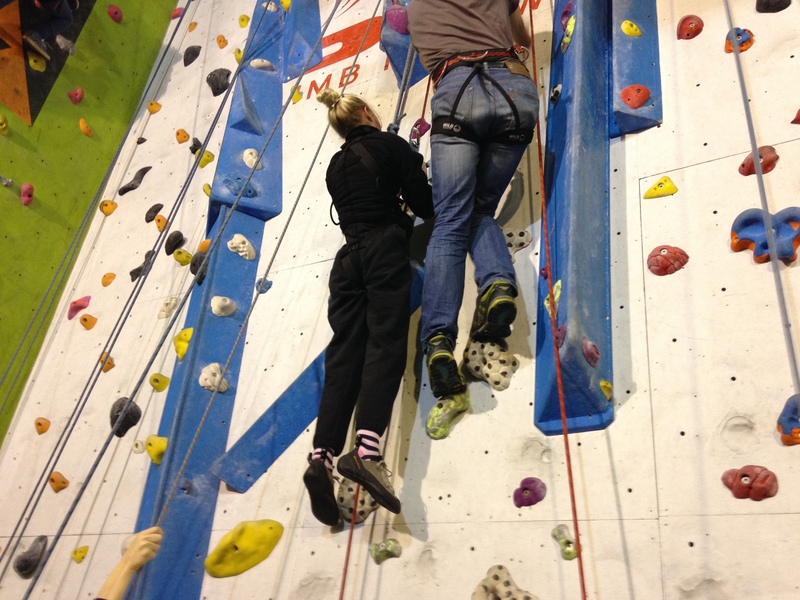 Great climb! But strangely the speaking valve has fallen off unnoticed again, and this time we can’t find it anywhere. Time for the Swedish Nose – handy to keep the trache covered, though not good for audibility. For the 3rd climb, we’re going to use the static line and jumar again. Another chance to find out what that loop is called: apparently it’s a “maillon”, which is a French word and is pronounced “my on”. Nick is thinking of something linked to the jumar to involve Clare’s legs. That’s for a future session maybe. Meantime Clare still manages to lift her feet quite a bit, even while pulling with her arms. We’re laughing afterwards, Clare as well. Some of Clare’s hair has been pulled off in the ropes, the speaking valve is lost, and there’s a scratch on Clare’s forehead. Heh heh, good session! And now, it’s right before Xmas. And even chillier. Robin and Nick are wearing hats. Robin isn’t 100% – he looks paler, has a cold/cough, and had a day off school in the week. He’s still doing his paper round and outdoor stuff though. Hazel has been off school too – for the first time ever. Nick had thought Slab, but said it was even colder over there. A small electric bar heater way overhead is heating up the doorway end of the cavern, but not by much. Nick points at some nicely grabbable red holds. So are we going to give Clare hints or not? Who knows. Let’s see. Nick is showing us an extra line joined onto the pulley rope with a steel karabiner. 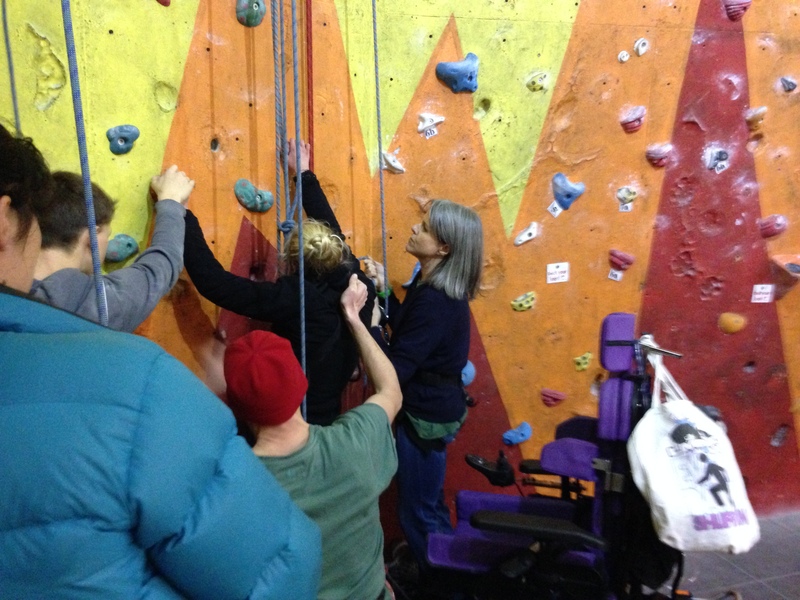 It was inspired by the other 3 wheelchair users (they’re still climbing weekly, hurray!) and its purpose is to remove a finger entrapment risk. 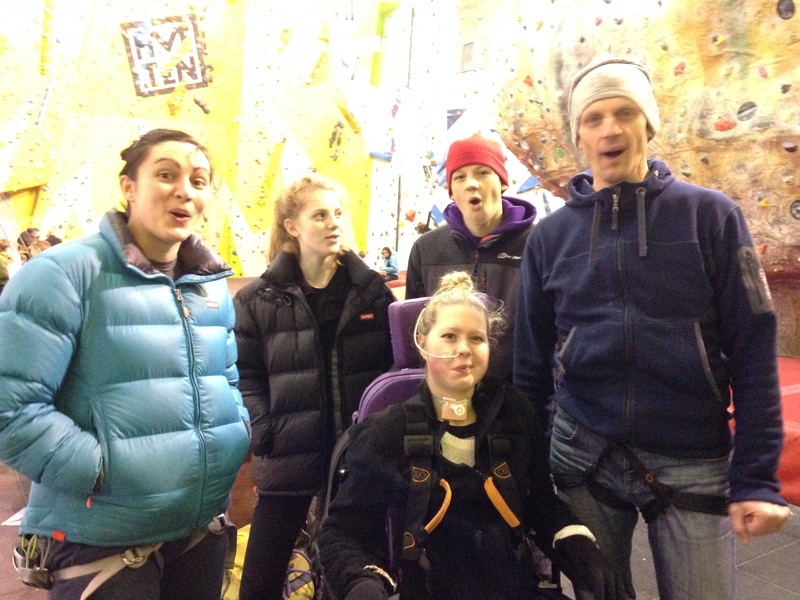 Its use has been discussed and approved by Foundry manager, Neil: it adds one more complication to the gear, not usually a good thing, but it reduces stuff in front of the climber’s face. We try to think of a name for the new device, having already come up with “Whittaker” for a jumar with straps. Perhaps it’s a “Whittaker single strand”. She’s finding footholds. It’s amazing: her leg lifts right up. She’s recently restarted lifting her knees up to her chin again – she always used to sit at the table to eat with her knees under her chin. She is looking down to see where her feet can find holds, and working hard to get them there. Even managing to do it without help sometimes. At the end of the climb, Nick says “quantum leap”. It was a “step change”. Real freedom to move. Freedom from the wheelchair. Long chatty rest. Just before the Xmas break it’s the Mock GCSE season. Clare spent the whole of Tuesday (given extra time) on her English Mock, and both Clare & Robin have Geog Mocks next week. Nick is about to apply for Ultra Trail du Mont Blanc: there is a 1 in 5 chance of getting a place. He’s entered an ultra marathon race near Grenoble too. Helen is off to Norfolk for the Christmas hols. She has completed 1 year at Hilltop School and has brought along cake to celebrate. “Lots of icing for Clare!” says Helen. The second climb isn’t so high, but still a great effort. Clare does some high leg lifts but it looks hard to get her arms raised and down below we’re asking if Clare is tired. She comes down. Phew! We’re all waiting to try Helen’s cake. Wow – white choc & orange, with the most fabulous icing I’ve ever tasted. It’s a sumptuous end to a year’s climbing. What a journey this year has been. 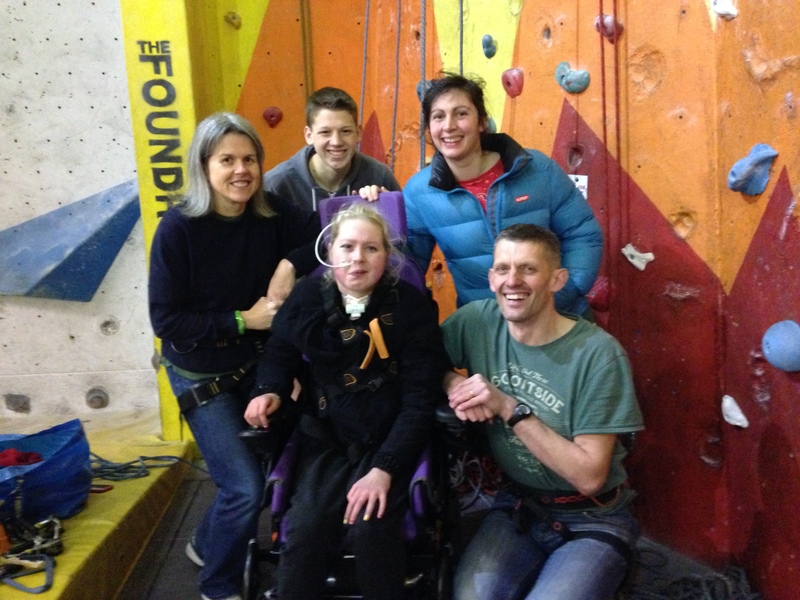 Climbing has become part of Clare’s life and this makes her very happy. This is THE MOST AMAZING ACHIEVEMENT!!! WELL IMPRESSED! Is that The Foundary in Sheffield? My answer: to walk. Whilst my wheelchair was o important and useful to me in hospital and beyond it represented something I despised. Just my truth.